Recently my neighbor told me her daughter was expecting a baby boy any day. Yikes! 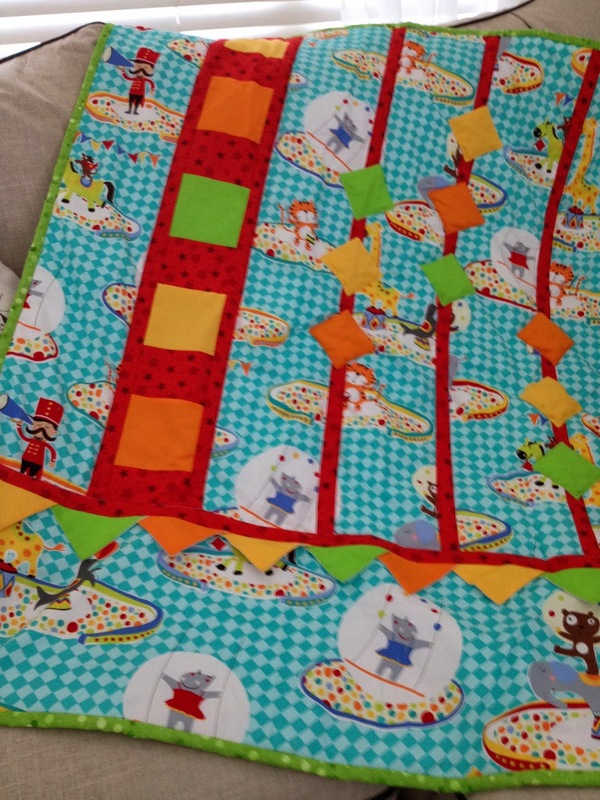 I needed a baby quilt and fast. Of course I could have gone to the store and bought something, but I like my neighbors and wanted to do something special. I started going through all of my books and magazines to find something appropriate that could be made in a weekend or less. Imagine my relief when I came upon Erla Gudrun's darling baby blanket in her book Fast & Furious Home. This pattern was just perfect for a new baby boy. I found the cutest circus material and was amazed at how quickly it came together. Needless to say my neighbor and her daughter were thrilled and the nice thing is that I got the quilt done before the baby arrived. Whew! I really liked the simplicity of this quilt pattern and, of course, I was pleased it whipped up so fast. This pattern is definitely a keeper!